I hear this or some variation of this many times a week, often many times a day. It apparently comes with the territory with multiple children. It throws me for a loop every time. I am an only child. I didn’t have to share or take turns with a sibling on a daily basis, but for some reason, I developed an overpowering sense of fairness. I try desperately to help my girls settle each squabble or issue fairly and quickly. Man, I hope so. I hope they will exit childhood knowing there is unity and peace in family and that they are loved by their parents and each of their sisters, very, very much. Times up! Now it is your turn to take 5 minutes and put together a post! It’s been awhile since I joined in 5 Minute Friday, but it is a fun writing exercise. The rules are simple, link up with Lisa-Jo, write for 5 minutes on the given topic, visit and comment on the blog that linked before you. When I think of dancing I think of my friend A’Driane at Butterfly Confessions. She sometimes does a Dance Party Friday where she chooses a song and does a great video of her dancing. She gets me dancing along every time! My favorite of her songs with “Stronger” by Kelly Clarkson. I can’t help but think about it every time I hear the song. Thanks to A’Driane I now have the cutest dancing baby in the world. Anytime Patrice hears a catchy song she puts her hands in the air for ‘raise the roof’. Seriously, it is as cute as it sounds. I also think of King David, in the Bible, dancing before the Lord. I think we were made to dance. It is so natural in my baby girl (and my older ones too). And even natural when we get excited worshipping the Lord. My 5 minutes is up. Now head on over to see what others have written. Won’t you join us at The Gypsy Mama? I am grateful for so many things. I am grateful to the Lord for giving me a husband who loves me completely, and three beautiful girls. The doctors had told me for so many years I would never have kids. And here I am with three, the desire for more. I am grateful for every step I run. 15 hospital stays in 3 years, two a month long each to learn how to walk again, and here I am, running. I’m getting ready to do a 10k (6.2 miles) run next month! I remember teh day I was working so hard in therapy to learn how to walk again. It was slow and not pretty. They had my dog with me. He got bored waiting for me and laid down. He can’t do a whole run with me now. I am grateful for how far I have come in the last year. Postpartum depression and anxiety was hard. Really hard. Every step hurt my heart and my soul. I don’t even know how many times I asked if I would actually survive it. And I am. Dare, I say I am thriving? Yes, I am. I have so many people to thank for that–my midwife, hubby, friends, family, #ppdchat mamas. So many. What are you grateful for? Come share! As I mentioned, yesterday was 7 years since my dad died in a car accident. Even as I type those words, I fight to believe them. 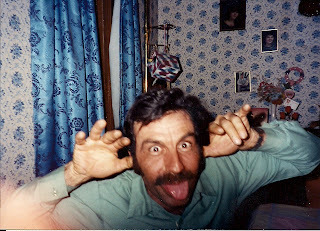 It does not seem like it is possible my strong, healthy, funny dad is gone. It does not seem possible that he was not at my wedding and has not met any of my children. I have a lot of regrets over some lost time with my dad. There was some time after college where we were quite far apart on several issues. It made conversation hard. I didn’t know how to work through the issues, so I let the 4 hours that separated us be a safe barrier between us. I know why, and my reasons were valid, but I regret it, nonetheless. But this is not about regret, it is about being grateful. And I am extremely grateful for a conversation I had with my dad exactly 2 weeks before he died. I had just gotten engaged to the amazing man I now call my hubby. It was a dream come true. And we were making the rounds telling people. I was looking forward to telling my dad. Just two weeks later he was gone, and I was left with my regrets, but also with that one call. That healing call. And for that I am eternally grateful. That is my 5 minutes writing about what I am grateful. Won’t you join the fun? Oh I wonder, wonder, wonder, who, oh who, who wrote the book of love. I look at my life and see a lot of love. Yes, in my children, but even more so in my husband. He is an amazing man. He makes me laugh. He holds me while I cry. He drives me bananas. He loves me by loving our girls. God wrote our book of love. And a precious story it is. He wrote the pages where my husband loved me in spite of the Multiple Sclerosis. Where he loved me in spite of an explosive temper. Where he loved me through the ups and downs of three pregnancies and the darkness of postpartum depression. And what a beautiful book of love He wrote for us. The end of the week – a good time for few words. Want to take five minutes with me and see which ones bubble to the surface? 1. 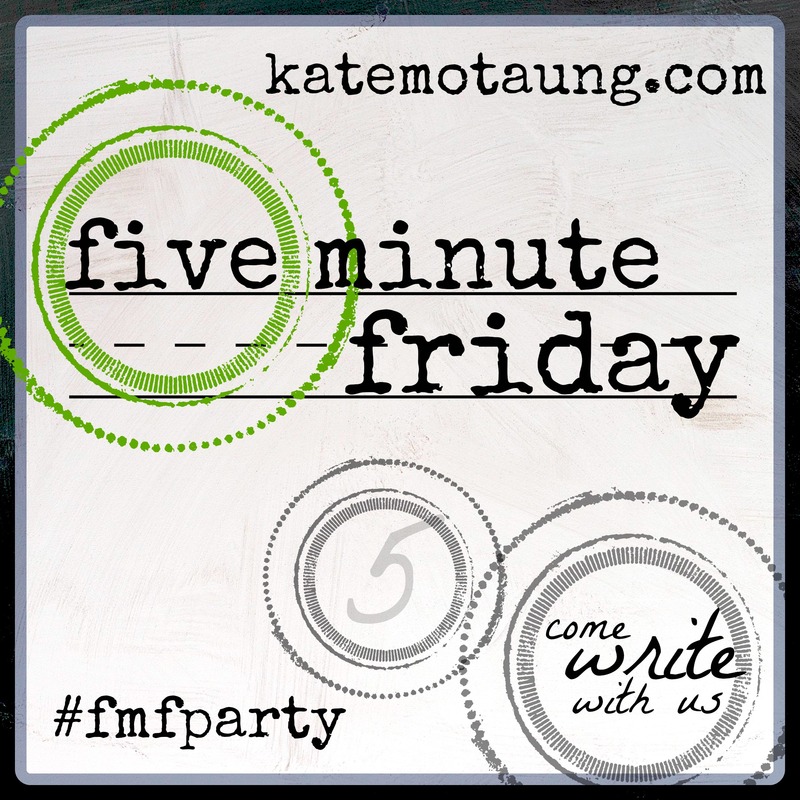 Write for 5 minutes flat with no editing or tweaking. It’s a great way to exhale at the end of a beautiful week. We made it to Friday. Through a full-week back at work. And I think I did it rather well. Much better than I handled it before my medical leave last month. That makes me think of when I was little and my mama didn’t feel like cooking. Her go to food was french toast when she didn’t feel like making dinner. My mama’s french toast concoction was egg, milk and cinnamon. Always made with white bread. Yum, yum, yum. Having breakfast for dinner was a normal part of growing up for me. This was not the case for my hubby and thus far, I have not been able to get him to embrace the concept. But he does a fine job with breakfast at breakfast time. Almost every Saturday and Sunday he makes pancakes, french toast, waffles of eggs. He is awesome at it. Honestly, he is just an all around good cook. I require a recipe, he can just take ingredients and put together a yummy dinner. Did your family do breakfast for dinner or was breakfast just for breakfast? Another Friday, another fun 5 Minute Friday with the Gypsy Mama. We write for 5 minutes, no editing, just 5 minutes. Check out what I have to say and then head over to see what others think. Today’s prompt, Motherhood should come with… A friend who has been to the dark side of motherhood. A friend who is willing to ask, how are you emotionally. And not believe you automatically when you say fine. And not be scared when you share what a wreck you are inside. But totally believes you when you say how much you love your kids even though you are a wreck inside. I have found mothers like that in my recent journey with postpartum depression and anxiety. Some I knew about beforehand, others, I never would have dreamed had walked this road. I have also met several more via Twitter. There is this amazing group of women out there under the hashtag #ppdchat. They are amazing. Some are at the beginning of the journey, some are survivors. All have a heart for each other and what life is dealing us right now. Can I ask you, please check on new mamas you know. When you ask them about nursing and how the baby is sleeping, also ask them, how are you mama? How are your emotions? Ask, you never know what life you might help save. 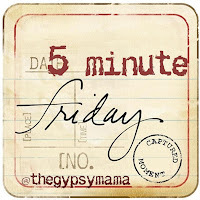 The Gypsy Mama hosts a fun blog hop, 5 minute Friday. She gives us a prompt to write about for 5 minutes flat. No rewriting, no editing, just honest writing. She then asks we link up with her site and give comment love to the person who linked right before us. Here goes… IF I KNEW I COULD, I WOULD… If I knew I could handle going back to school and raising kids, I would go back for a whole new career field. I would go back to school to become a certified nurse midwife, especially if I knew I could be an amazing blessing to women like my midwife has been to me. * I would want to be the blend of midwife I see in my own. She loves and embraces the women she works with. She loves and embraces the birthing process. She blends the natural elements of birthing with what can and should be done medically to give women a successful birth. Yes, I know in a perfect world, birth would require no “help” but it does. We are told in Genesis that birth would now be accompanied by pain. I believe, like all other things affected by the fall, the element of sin continues to degenerate things, so birth is not only accompanied by pain, but can also be accompanied by complications. I understand birth is not always a medical emergency. I know people who have carefully and wisely chosen very natural births, but for me and my household, we love the blend of care our midwife provides. Now it is your turn! What would you do if you knew you could? !